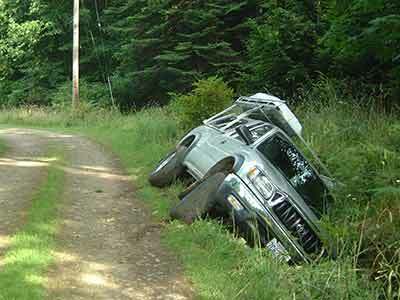 OK, OK, I know I should be watching the shoulder (especially when there isn't one) when backing up. For details of this dumb debacle, see below blogsite. As the truck was rolling over, it seemed like everything was in slow-notion, I was thinking this can't be happening. Or, you can get there at any time by going to: www.lloydkahn.com. My latest posting is on the sentencing of my long-time friend lawyer Tony Serra last Friday to 10 months in prison. (Yeah, I know it, I'm all over the place. but it's too late in life for me to begin sticking to a few subjects.) Read all about it at above website. Before I took off on the trip, Hugh Brady, familiar with the builders on islands in British Columbia, told me that there was nothing in HOME WORK like work that had been done in B.C. He was right. Now that I've been back a week and the dust has settled, and I've had time to review my photos, I'm thinking that my next full scale book on "shelter" will be on the builders of the Northwest coast. The ostensible purpose of the trip was a book on builders in North America in general, but I found such a body of unique work on the coast, especially in British Columbia, that it seems to merit a book on its own. Working title is BUILDERS OF THE NORTHWEST COAST. I'll keep shooting pictures of builders throughout America, but will take another trip to the Northwest this year to shoot more pics. We're changing the cover from the rather 50s-looking bodybuilders to sports photos as shown. 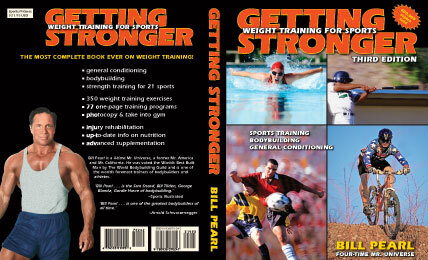 The new cover will emphasize the most unique part of the book, the do-it-yourself training programs for 21 sports. With all the interest in sports training these days, we're hoping bookstores will put it face out more often. We are also updating photos of the different sports inside the book, with new, more contemporary photos of baseball, basketball,football, golf, soccer, tennis, track & field, and volleyball. GETTING STRONGER has sold close to 600,000 copies. We hope to increase its usage as a text book for high school and college athletes. The new book will ship in December 2005. 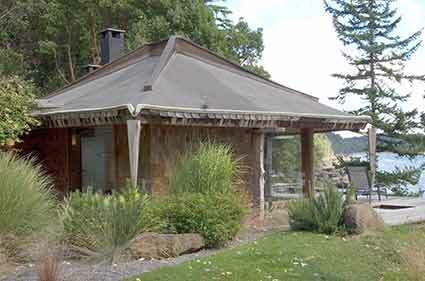 During the same couple of days I was reading about Maxxam, I photographed Tony and Julie Anderson's house up a steep hill from the Mattole river, one of the great California coastal rivers. (I had this great connection with Tony, the last time I'd seen him was when he was about 5 and I worked for his folks as a carpenter in Mill Valley). The Andersons had bought their land in 1990 from Albert and Laura Saijo. Albert had built a simple little funky cabin, filled with books, heated with a wood stove. "Albert called it 'biodegradable architecture,'" said Tony. Albert would park his truck nearby and run a wire from the battery to power 12-volt lights. Water came from a pipe in the creek leading to a 5-gallon storage tank. Simple! Anyway, the Andersons and Saijos sat down and agreed on a price for the land. A few weeks later Albert came back and said. "Laura and I think that price is too high." And so they reduced the price (not inconsiderably), and the young Andersons had a beautiful homesite. Albert and Laura just walked away, leaving everything, including a huge library of books, behind. Zen freedom. A week later I thought about the Saijos and how this spirit of the '60s, of treating the earth with respect, and people with fairness, has faded. How different from today's government-sanctioned corporate pillaging. I said something to Lesley the other day about what's coming with the Supreme Court and she said, "We're going into another dark ages." Steel-framed sculptural house overlooking sea by Dean Ellis. 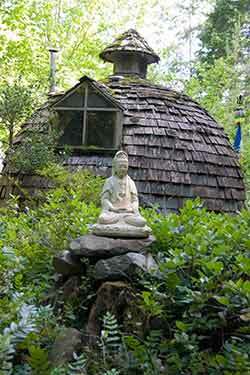 Dome at a meditation center deep in the woods. It's rare for a geodesic dome to have such good vibes. The China Cloud, a by-now-legendary 3-masted junk-rigged wooden sailboat, now at a dock west of Victoria, Vancouver Island, B.C. The China Cloud was sailed for over 20 years with no motor. It was built by by Allen Ferrell at the age of 70 over a period of two years out of beach driftwood, with no power tools. It was featured in the book SAILING BACK IN TIME by Maria Coffey and Dag Goering, about a 3-month cruise along Canada's west coast. 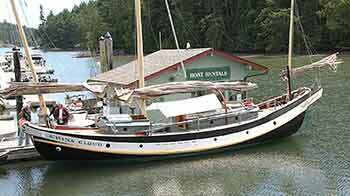 It now belongs to boat builder Gerry Fossum. It's beautiful, a boat with soul. Guys who run my favorite coffee stand told me they call the "non-fat de-caf latte" the "Why Bother?"